Abu Dhabi UAE, 26 February 2013: Abu Dhabi Ports Company (ADPC), the master developer of ports and industrial zones, has signed a Memorandum of Understanding (MoU) with Etihad Rail providing the framework to plan an integrated bulk and container railway terminal facility at Khalifa Port as part of the UAE’s national railway network. 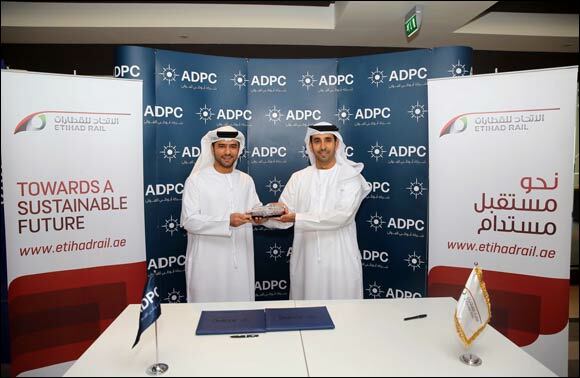 The MoU was signed recently by HE Dr. Nasser Al Mansoori, CEO of Etihad Rail, and Capt. Mohamed Juma Al Shamisi, CEO of ADPC, at Khalifa Port’s visitor center. The agreement is a significant step for the UAE’s rapidly-progressing rail network and the country’s growing ports and industrial sector. The 1,200-kilometer Etihad Rail network will complement ADPC’s world-class transportation and industrial infrastructure linking ADPC facilities, including Khalifa Industrial Zone Abu Dhabi (Kizad) and the adjacent Khalifa Port. When integrated with ADPC’s infrastructure, the railway network will offer logistics companies an enhanced transportation system combining sea, road and rail. The Etihad Rail network will also form a vital part of a wider GCC railway network, connecting the UAE with Bahrain, Kuwait, Oman, Qatar and Saudi Arabia. Al Shamisi added: “As the activity of the emirates ports and industrial zone increases, a sophisticated transportation network throughout Abu Dhabi, the UAE and the Arabian Peninsula becomes of the utmost importance. “Our new flagship Khalifa Port will be among the first in the region with a fully integrated bulk and container logistics solutions with railway services extending to the GCC, offering our customers, shippers and investors in Kizad unrivalled supply chain efficiencies. The state-of-the-art Etihad Rail network is being developed in three stages. Construction on Stage One, which will extend 264 kilometres from Shah and Habshan to Ruwais in the Western Region of Abu Dhabi, is well underway. Testing and commissioning on the Habshan-Ruwais route commenced last year. In addition to connecting to key ADPC hubs and spanning 628 kilometres, Stage Two will extend the network to Dubai, to Saudi Arabia through Ghweifat and to Oman through Al Ain. Stage Three will add another 279 kilometers of rail and connect to the Northern Emirates, including Fujairah and Ras Al Khaimah.